A Note: This is Part 3 of a 3-part blog on the Beat Street Series, with Part 1 reviewing The Beat on Ruby’s Street, Part 2 reviewing Fool’s Errand, and Part 3 featuring an interview with author Jenna Zark. Hi everyone! Please give a warm welcome to author Jenna Zark, who has graciously agreed to grant me an interview (my first!). It was a joy to read Jenna’s books and get to know her a bit through this interview. I hope you enjoy as well! A Note and Disclaimer: This is Part 2 of a 3-part blog on the Beat Street Series, with Part 1 reviewing The Beat on Ruby’s Street, Part 2 reviewing Fool’s Errand, and Part 3 featuring an interview with author Jenna Zark. I received free copies of the The Beat on Ruby’s Street and Fool’s Errand. I was not paid for my reviews and my opinions are honest and from the heart. I spend a lot of space on this blog offering advice based off my own experiences. This is my blog, after all. But, I feel I would be doing a disservice to all of you writer’s out there if I didn’t also share some of the goodness I’m learning from other blogs. I’m semi self-taught as a writer, and I owe a great deal of what I know (and what I therefore pass on to you) to many different, invaluable sources. 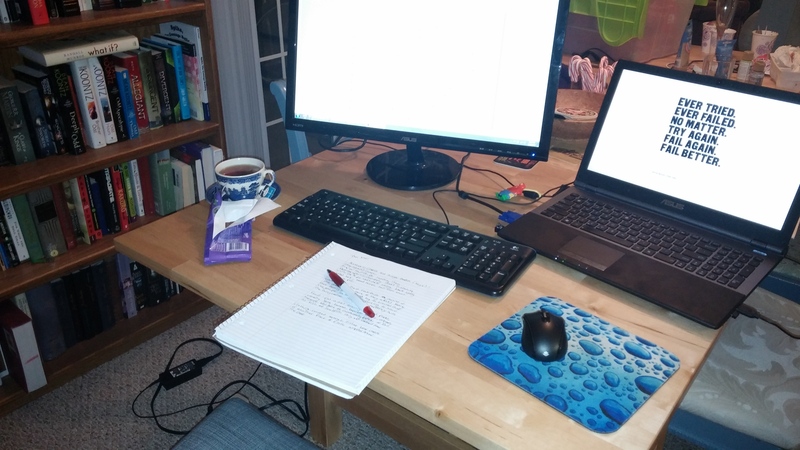 So, what follows is a list of my favorite blogs and writing resources. I hope it’s as helpful for you as they have been for me. WriteWorld: Offers various writing tips as well as “Writer’s Block” exercises. Small Blue Dog Publishing: Great advice for writing, traditional publishing, and self publishing. Her beta reading advice was particularly helpful for me. Slithering Ink: Very thoughtful, general writing tips as well as book and movie reviews. Yeah Write: More of a community base than strictly an advice blog, offering loads of resource links, ways to connect with other writers, and inspiration. Legit Writing Tips: This blog offers loads of tips and answers reader questions regularly. Writing With Color: A very good blog for any writer, but especially if you’re considering writing the stories of people of color. Fishing Boat Proceeds: John Green’s Tumblr blog. He mostly just reblogs/shares, but occasionally he opens his Ask Box. Samantha Shannon: Samantha Shannon’s Tumblr blog. She regularly answers questions about the publishing and writing process and is also generous with reblogging other writer’s advice. N.K. 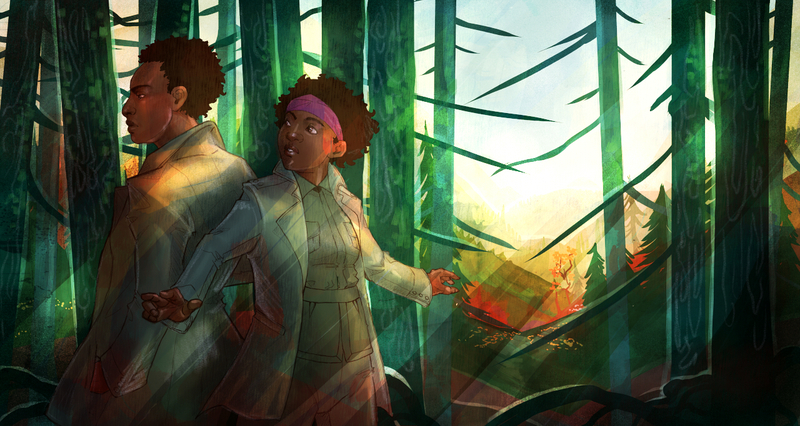 Jemisin: Author N.K. Jemisin’s blog. I only recently found this blog, but she gives great advice. Also, she talks about video games, which rocks. Kate Elliott: Kate Elliott’s blog. Another great writer offering really good advice. Behind the Name: A good jumping off point for finding character names. However, be wary if picking a name from an unfamiliar culture. It’s always best to do further research. Good Reads: A good spot for connecting with other writers or your readers if you have published work. TV Tropes: Despite its title, this site is not limited to just television. Great for checking your story for problematic tropes. Do you guys have any favorite writing advice or author blogs? Oscar and Mary Drake. Art by Michelle Luise. I’m so excited today. Why? Because I finally have a visual representation of my work-in-progress’s main characters, Oscar and Mary Drake. This picture is so beautiful. I love the lighting, particularly how it streams through the trees. I love how you can get a little glimpse of Oscar and Mary’s personalities just by seeing their faces. It’s just so AWESOME! I’m also pleased as punch to say the picture was drawn and colored by artist (and good friend) Michelle Luise. She did such an amazing job. What’s more, she agreed to answer a few of my questions on her art and her process. I hope you guys enjoy this interesting insight into an artist’s world! H: How long have you been an artist? Did you go to school for it, or are you self taught? M: That’s a bit of a tough question! I’ve enjoyed creating art for most of my life, but I would say that I really started to draw consistently around 2001, so I guess about fourteen years at this point! I’m primarily self taught, though I did take art courses throughout my college career, as well as several courses over the past decade dealing with graphic design. It’s been in the last four years that I’ve begun to take art more seriously as a potential career path. H: What is your favorite medium to work with? M: My work is done primarily using digital means, and I would say that is my favorite medium to work with! I currently work with a decade old Wacom Intuos 3 tablet, and the bulk of my work is done using Paint Tool SAI, though I will occasionally use Manga Studio/Clip Studio Paint for inking. Working digitally allows for me to cut down on art supply costs – while a tablet and art programs are expensive up front, I don’t have to worry about the costs for canvas or paper, etc. When it comes to traditional mediums, however, I do enjoy working with charcoal or graphite. H: When you decide to draw a person or a scene, how do you start? Is the picture fully formed in your mind at the beginning, or does it take shape as you go? M: It depends on the piece! A lot of time, when I’m constructing a piece, I do have one particular part in mind but not necessarily the entire image. I will often times know the expression that I want, or I know one tiny piece that absolutely needs to be included, and the whole image can be built around that. A recent piece I did, for example, was constructed around wanting to draw two characters clasping hands – from that point, I worked to figure out how the rest of the drawing would work in relation to that part of the pose. For the painting of Oscar and Mary, I decided early on that I wanted to position Mary facing the viewer, with Oscar behind her. Their exact poses changed a few times, but where they were in relation to each other stayed the same. Other times, I will have a set goal in mind when working – I want to use negative space effectively, or I want to use a particular color scheme. There are, of course, times when I have a full, complete image in my mind. Actually, at initial concept stages, I do almost always have a complete image. However, I try to focus in on what parts of the piece I consider the most important aspects and work around those, and I do try to be flexible, as sometimes the complete image I have in my mind does not translate to a drawn image quite how I envisioned it. H: Are you strictly interested in producing portraits/drawings, or would you also consider working on cover art or book illustrations? M: I would absolutely consider working on covers or illustrations! In general, what I most enjoy drawing is the human face and figure, but that by no means limits me to only portraits. I have actually done some work in the past with designing book cover images, and I’m currently working with a close friend on a short comic. Drawing more complete scenes and paintings is something that I am certainly interested in working on more! H: Are you currently accepting commissions? M: If I was answering this yesterday, I would say yes, but I am now actually fully scheduled with commissioned work! I will likely be opening up commissions again in the next few months. H: Where can people see your art work? M: I am currently working on putting together an online portfolio where people will be able to view my artwork, though I do not yet have this up and running. This is another thing which will be hopefully up and running in the next few months!